This pretty romper from Tobi comes in the world’s prettiest soft shade of green! It’s sort of like a light olive and can be worn both during the day and night. Originally priced at $62, the romper is now on sale for only $24! I have even better news about the price. If you are a first time shopper at Tobi, you can get another 50% off if you register for their email list. This is such an amazing deal! Now, back to the romper: It’s the most perfect cut and fabric for summer, as it’s light and flowy to ensure that you’re cool throughout the hot summer days. It has an amazing halter neckline that looks so incredibly flattering. This gorgeous romper also comes in a black color but I have to say, I’m partial to this beautiful shade of green. This outfit is a perfect casual daytime look. I think the combination of the light olive green and white is so pretty: They complement each other perfectly! As I’ve mentioned on countless occasions before, I’m a HUGE fan of espadrilles. These ones have platforms so you get the elevation AND the comfortable shoe. It’s a total win-win. While hats are often associated with being worn simply at the beach, I think they’re perfect for all summer occasions. They’re incredibly pretty and also protect us from the sun’s harmful rays — win-win! This look is perfect for a fun brunch with friends. I’m so in love with this whole outfit. The color combination of pink and green is definitely one of my favorites. Also, the sandals are so summery and almost have an ancient Roman vibe. As I’ve mentioned before I’m a huge fan of the clutch bags from Estee & Lilly which are sold at Target. They come in so many different colors and styles and each one is more gorgeous than the next! I love this simple scalloped edge one. When it comes to makeup, I’m all for mixing and matching shades. As the whole outfit has the tropical pink and green feel, I thought I’d bring a little in with the (optional) eye makeup — up to you whether you want to match or not. I also adore the headband! It brings a fabulous print to the look and the bow knot is so classic. This is a perfect casual yet sophisticated evening look. While we are continuing with the same fabulous romper, there are three additional components that make this outfit nighttime goals. The first is the GLITTER! The sparkly clutch and heels pair so perfectly together and due to their elegant and neutral coloring, they could be used with many pieces in your wardrobe. The second component that takes this over the top is the sweater blazer. This romper alone is a casual piece but adding a beautiful blazer provides a hint of formality. This wonderful item from J.Crew Factory (another favorite store with fabulous discounts) is, as its name suggests, a cross between a sweater and a blazer. You get the comfort of a sweater and formality of a blazer in one, I love it! Lastly, the makeup included with this outfit gives it more of an evening look. The darker lip color (only $1.90 from Forever 21) provides a bit of edge. I am also such a big fan of this elf bronzer. I can’t get through my day without elf cosmetics, as you guys know! Do you like this romper? What are your favorite romper colors or styles? 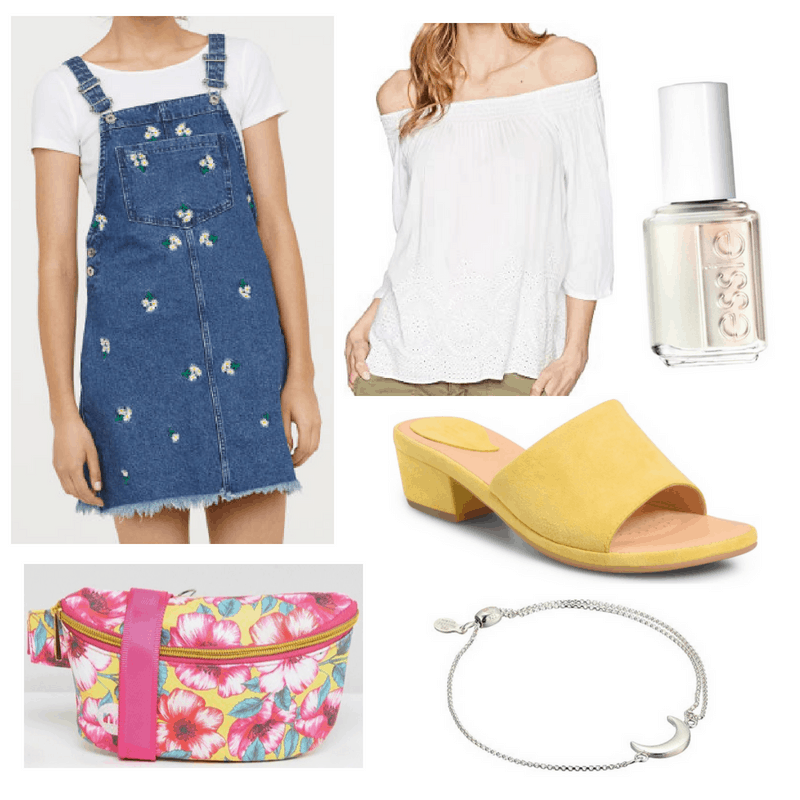 What are your favorite summer trends? Start the convo below!